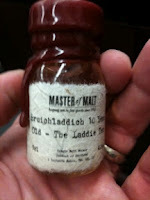 The Coopered Tot: Bruichladdich "The Laddie Ten" outshines the beauty of its tale. Bruichladdich "The Laddie Ten" is a phoenix rising from the ashes. Bruichladdich ("normally pronounced brook-lad-dee, or by some Gaelic speakers as broo-ee-clah-dee" according to the wiki article) was built in 1881 with the highest stills in Islay - to produce a pure and lovely spirit. It had a characteristically Hebridean history of conflict, struggle, and many instances of changing hands until 1994 when it was closed - apparently forever - for being "surplus to requirements". It was purchased by a group of investors led by Mark Reynier of Murray McDavid on 19 December 2000 and Jim McEwan was brought from Bowmore (where he had worked since the age of 15) to manage the operations. McEwan's creative vision has made Bruichladdich one of the most dynamic and exciting distilleries in Scotland in the years since - mainly through the use of creative finishes on old stock produced before the shut down, and through the creation of young strongly peated expressions. The classic style of Bruichladdich - unpeated, sweet and floral with a hint of sea, takes time to mature. That meant waiting until at least 2011. And indeed that's what happened. The Laddie Ten is the classic style, made entirely by the new Bruichladdich team. "The ten year old single malt, the first distilled under the new regime, went on sale following an emotionally charged ceremony as the bottles began to come off the Islay bottling line." "Managing Director Mark Reynier, the man behind re-establishing Bruichladdich, said “It’s an inordinately proud and emotional moment for all of us. This is our first spirit we distilled once we got the old girl going again. And it’s not been easy; the Laddie 10 is the very hard-won fruit of a decade of unrelenting blood, sweat and tears by the whole team.'" 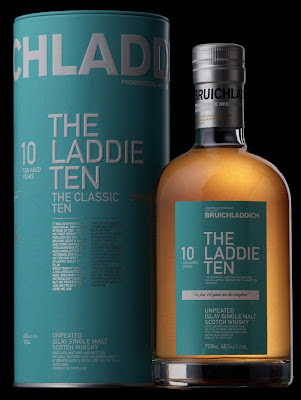 "The Laddie 10 is created by whisky legend Jim McEwan, designed to show off the timeless, Bruichladdich qualities of elegance, balance, purity and fruit, with that famous sea breeze tang." It's a moving legacy for a dram of whisky. The question is - is it good enough to honor the legacy? 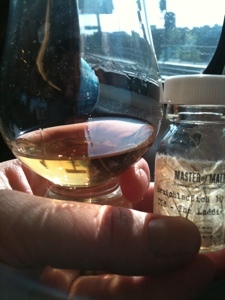 Bruichladdich The Laddie 10 46% abv. 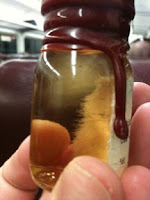 Nose: honey, heather floral blooms of sweet roses and magnolias and less sweet lilies and daffodils - rich and lovely. A hint of citrus. Then a whiff of band-aid vinyl, salt air from ocean breeze. A classic Laddie aroma. Entry is gloriously honeyed, sweet and floral with a lovely silky mouth feel. Notes of yellow pear and bourbon vanilla seeds billow. The mid-palate expansion is spicy and rich. Floral vanillas, creme broullet custard (without baking spices) fill the mid. The turn shows a whiff of peat, not as smoke or earth but as a dusky note and a tingle of spicy warmth. The finish is long, gentle, warm and only slightly oaked. Few tannins, but some lingering spice of peat heat. A delightful sweet lacy floral yet spicy and character-filled dram. This is better than the Laddies of the 80s and 90s by far - but squarely in that classic style. McEwan has fully redeemed Bruichladdich and then some. Way better than I was expecting. A superb standard expression of Laddie. A few drops of water amps up the less sweet floral notes at the expense of the sweeter perfume in the nose and makes the hint of sea a bit brighter. On the palate sugars are accentuated, but at the expense of some mid-palate richness. Pear comes close to turning to melon. Water is marginal at best. Perhaps just one or two drops. It's the conflation of sea and peat that complete as a foil the white fruit sweetness and floral entry that is so beguiling here. Borderline 5 stars and as pleasing as any $50 bottle of Scotch Malt that exists on the market. A lengthy discussion on twitter concerned where the peat flavor notes in this expression (and Rocks) comes from as these use unpeated malt. The consensus (led by Oliver Klimeck of Dramming.com) is that it isn't coming from the water, but rather from cross contamination from stills, mash tuns, and other distillery equipment that is used to produce peated expressions at other times. "Am I sad about this? Sure, a little bit. But this is the nature of the business. Distilleries get bought and sold. Even fiercely independent ones… Hopefully, a deal like this will be good for the consumer in the long run. Now that, my friends, makes me sad." "So, the purists may be aghast at today's news. But, ask yourself this: if somebody came to you to buy what you have found to be "a rollercoaster, not just a financial rollercoaster; it's been an emotional rollercoaster" since you bought it for US$10.1m 12 years ago, and offered you around US$52.8m, what would you do?" (note - subsequently Mr. Wehring has informed me that the final figure is around half that . However when the news of the deal finally broke, the final figure is 58 million pounds - quite a bit more than the original estimate). 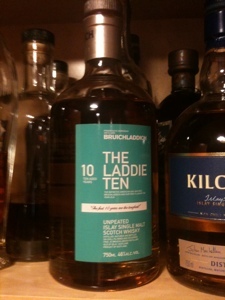 @scotchblog I wonder what will happen to the integrity of the product...we're just getting to the good stuff with the laddie 10. Indeed, the Laddie 10 has been a frequent topic in the issue of concern over the future of Bruichladdich - as a touchstone for the quality work that the team has wrought. @tmread @markreynier Awesome comment on the whole bruhahalala-ddich today, Tim. What a donneybrook. Do whatever is best for Laddie, Mark. @cooperedtot @tmread Remy have the funds to grow The Laddie even quicker than we can - & firmly establish it in the top ten. @cooperedtot @tmread it feels like a bereavement cycle: shock, sorrow, anger, regret, resolve, calm, hope. Guess it might to others too. @markreynier @tmread ..You saved it. For that I am eternally grateful. With luck it will be here long after we are all gone: bigger than us. @cooperedtot @tmread That's the idea. @cooperedtot @tmread "one can only regret what one didn't do." 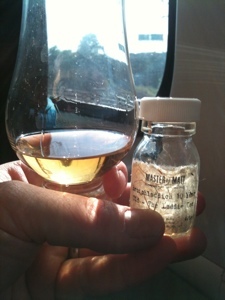 Agreed, the couple of tastes I've had of Laddie 10 have been amazing. Definitely a distillery to keep an eye on, as more and more new expressions come out. A pretty terrific dram with a very accessible price tag. Loved this expression and it makes me look forward to future expressions! Sounds like a tasty dram. Sadly I missed out on picking up a cheap bottle when Washington was clearing out stock before privatization last month, but I'll get around to trying it one of these days.